Every freelancer knows the client who turns a 2‑week project into 2 months. Instead of starting your next job with a clean plate, you’re frantically wrapping up a never-ending deadline. Cushion lets you plan months ahead and provides a bird’s-eye view of your entire year—automatically detecting your availability and when you’re overbooked. Cushion was exactly what I was looking for when I was overbooking myself without realizing it. A consistent income is all but a dream for most freelancers, so each year becomes a rollercoaster ride for your bank account. Cushion keeps you on track with your financial goals by automatically adjusting your monthly goal throughout the year. And with multiple financial goals, Cushion helps separate what you need to make from what you want to make. Being a visual person, Cushion helps me understand where my income is coming from and when it’s coming in. There’s more to invoices than paid and unpaid. A few late invoices can force you to work overtime right when you were finally planning to take a break. 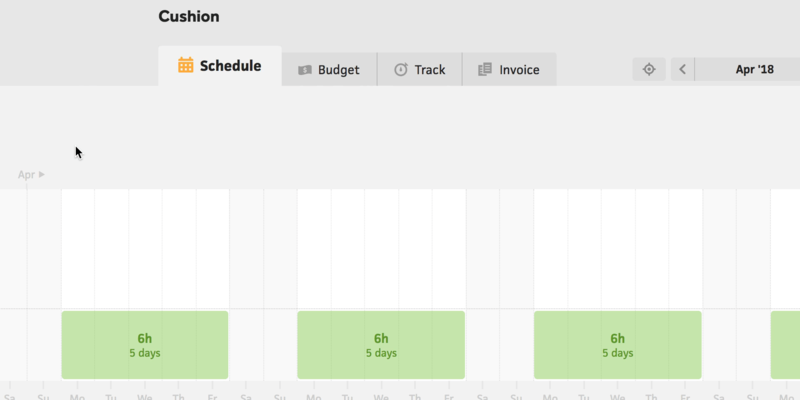 Cushion lets you send and visually track your invoices, so you can discover patterns in your pay schedule. If a client is always late, you’ll see it right away and know to nudge them ahead of time. Cushion is pretty to look at, easy to use, and tells me what I need from simple info. We realize that freelancers often use several tools to manage their freelance life. Instead of forcing you to switch entirely to Cushion, you can import your existing data and automatically import new data as you create it in Harvest, FreshBooks, FreeAgent, and Xero. We’re currently running a Stripe beta for accepting card & ACH payments. Thousands of passionate freelancers found peace of mind with Cushion, and we’re constantly working with them to shape Cushion into a better tool. Try a free 30-day trial of Cushion today.